Marvel and their cinematic universe has become a powerhouse we know we can trust. However their latest offering is a character that's just bizarre enough that many people won't give it a chance anyway. "Ant-Man" is being labeled the least anticipated Marvel film to date. In a way it makes sense, but then again they did just pull off a sci-fi film featuring a talking raccoon and a tree-man (who utters just one line of dialogue repeatedly) that did very well at the box office. And let's not forget that a certain other superhero we all know and love from a certain other comic book universe is named after a small nocturnal rodent. If we look at it from that perspective maybe "Ant-Man" isn't so strange. Marvel also proved they could apply different genres to their super hero outings when they made "Captain America: The Winter Soldier" in the vein of an old spy film. With "Ant-Man," Marvel has gone after the heist genre. Scott Lang (Paul Rudd) is a burglar, not a thief. As he tells us, thief implies there was a threat involved, but he avoids contact at all costs. He doesn't like violence, and much prefers thinking of himself as a cat burglar. However, he's just getting out of jail and his love for his young daughter have caused him to reassess his priorities. For her sake, and his own, he doesn't want to be a criminal anymore. However, when Dr. Hank Pym (Michael Douglas) recruits him to help with a theft, he finds himself involved in a gray area, where doing something illegal might just be the right thing to do. Years ago Pym had developed the tech behind shrinking matter down to insect size. The shrinking makes cells far more dense, which in turn makes the wearer of his suit extra tough and extra strong, much like an ant. However, he sensed the danger behind the technology, especially if it were to fall into the wrong hands, so he hid it from the world. However, now his former protege Darren Cross (Corey Stoll) is on the verge of a breakthrough developing similar tech. Cross intends to create an army of insect sized soldiers that could secretly infiltrate and demolish anyone opposing them. He also intends to center his business around selling this tech to the highest bidder. We're led to believe the highest bidder might be Hydra, or a secret Hydra sleeper agent that had infiltrated SHIELD. No matter who Cross intends to sell to, it's dangerous tech that shouldn't be sold to just anyone. So Pym and his daughter Hope (Evangeline Lily), enlist the help of Lang. Hope is a skilled martial artist, a skill she learned while mourning the loss of her mother, and now she passes her knowledge onto Lang. There is a growing rift between Hope and Pym due to his overprotective nature that refuses to allow her to take the risk of using the suit, and his refusal to give her the real story behind her mother's death. All of these things come out in due time, and as it should be, it's perhaps the most satisfying of the storylines at play. Slightly less satisfying is Lang's own story. He and his wife Maggie (Judy Greer) are separated. She's engaged to a city cop Paxton (Bobby Cannavale), who thinks of Lang as a negative influence on his own daughter Cassie (Abby Ryder Fortson). Lang does, however, clearly love Cassie, and wants to be a part of her life. This desire makes him willing to do whatever is necessary to be allowed to be with her. Maggie gives him her demands, which include getting a job, paying child support, and otherwise proving himself a responsible adult. After failing to find and keep normal jobs, he finds himself lucky that Pym and Hope come along. The odd thing here is that they recruit Scott Lang for his skill as a burglar, yet the job they have for him requires a whole new set of skills. So essentially they could have recruited anyone who had the desire, since their skills won't help them much. What prompted Pym to find Lang was his desire to be close to his daughter. As a father attempting to protect his own daughter, Pym sympathizes with Lang's predicament. The skills he has to acquire not only involve mastering the suit's shrinking ability, but also the ability to use another piece of tech that allows him to telepathically control a swarm of ants. Some of the ants are used to carry objects, while others bite unsuspecting victims, while still other winged ants serve as transportation. Aside from mastering Hope's style of martial arts, Ant-Man has the added ability to shrink and resize himself as needed mid-fight. It makes for unique fight sequences including one later scene that features a highly abstract bit of artistry. While the stakes aren't quite as high here as usual, since Ant-Man's story and villain feels smaller in scale (no pun intended) than previous Marvel films, that's actually refreshing considering these films have continued to up the ante with every new entry. Where nearly every other Marvel hero film has ended in an enormous battle sequence that leveled a city, Ant-Man's size reduction allows them to subvert the trend by scaling the battle down as well. Rather than fighting off an army, we have a one on one battle, and rather than an entire city becoming an innocent victim, a child's bedroom serves as the arena in which they duel. Much the way they've always done, the powers that be at Marvel have done a good job of including just enough connection to the rest of the "Marvel Cinematic Universe" (of MCU for short) here to keep fans happy, yet it's not so reliant on in-jokes and references that a less avid follower would be lost. Finding that balance is important for these solo character films, and it's something they continue to do well. There are, however, implications for the future of the MCU, mostly tied to the 2 post credit scenes. Paul Rudd is already confirmed to suit up again as Ant-Man for "Captain America: Civil War," which figures to be a game changer in the greater MCU. 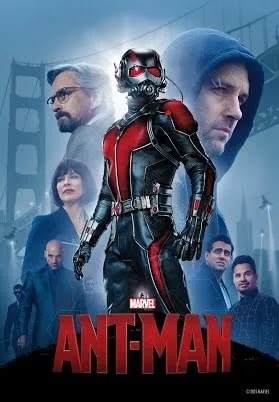 While "Ant-Man" has its share of sincere moments, it is primarily a funny, light-hearted film, and a film that proves Marvel's ability to vary their many films to keep from stagnating. They've always had a good sense of humor about their characters. Last year's "Guardians of the Galaxy" was a new high point for comedy in a superhero film, but "Ant-Man" rivals its fun factor and number of comedic elements. If you like what Marvel has been doing, but were on the fence about "Ant-Man," give it a chance. You won't be disappointed.